Jane Ann Laing, 90, of Marietta, OH passed away on Thursday, April 4, 2019 at her daughter's residence surrounded by her loving family. She was born on August 4, 1928 in Moundsville, WV to the late Albert Lynn and Virginia Price Hinegardner. Jane graduated from West Liberty University where she met the love of her life, Harry Laing. She was a school teacher at Limestone Elementary School in Moundsville, WV, a librarian at Shenandoah High School and a teacher's aide at Washington Elementary School. 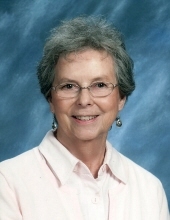 Jane was a lifetime member of the First Presbyterian Church, where she had served as Deacon and Elder and was active in the Women's Club. She enjoyed playing bridge, had served on the Betsey Mills Board and was a member of the P.E.O. Sisterhood. She is survived by her three children, David Laing (Ann), Lynn Ann Laing and John Douglas Laing (Teresa); five grandchildren, Jessica Schwendeman (Jeremy), Melissa Webb (Scott), Stephen Laing (Jodie), Paul Laing (Ashley), Alison Bess (Adam) and 10 great grandchildren. In addition to her parents, she was preceded in death by her husband, Harry Laing. The family would like to thank Marietta Home Health and Hospice for their care and compassion. Following a family graveside service at Oak Grove Cemetery, the family will receive friends from 2 to 4 PM on Saturday, April 13, 2019 at Hadley Funeral Home Reno Chapel, 1021 Pike St., Marietta, OH 45750. In lieu of flowers, donations may be made to the First Presbyterian Church, 501 4th Street, Marietta, OH 45750. To send flowers or a remembrance gift to the family of Jane Ann Laing, please visit our Tribute Store. "Email Address" would like to share the life celebration of Jane Ann Laing. Click on the "link" to go to share a favorite memory or leave a condolence message for the family.